Mint chutney goes well with all kinds of meats especially lamb and Indian samosas. In South Africa, mint chutney recipe is usually made of any tart fruit and savory vegetable. Many regions in South Africa are famous for their mint chutney. What is chutney? Chutney is a savory combination pickle and preserve made sweetly and very hot eaten with curry and rice. Add all ingredients to a blender. Blend well until smooth, add water as needed. 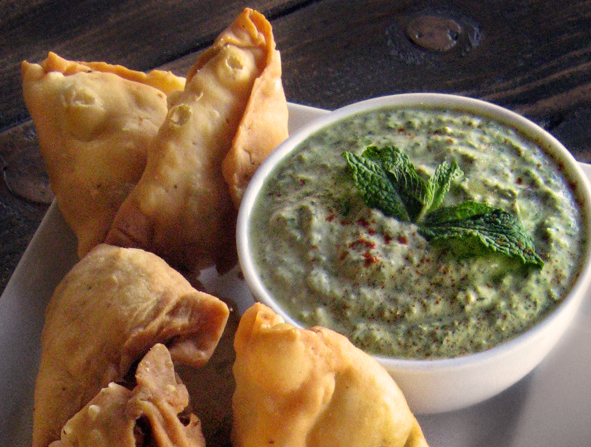 Serve mint chutney with all kinds of meats especially lamb and Indian samosas. Eating fresh mint leaves might help promote your digestion. Fresh mint leaves acts like a drug that relieves gas and its associated symptoms.